After the success of Pokémon Go, Nintendo's "Super Mario Run" has become the hottest game to hit the market with enormous popularity and massive social impact. The game has taken the world by storm since its launch for iOS devices over a week ago. 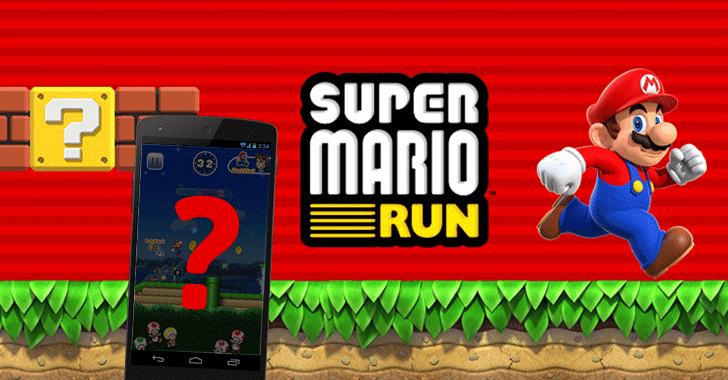 But if you have downloaded a Super Mario Run APK for your Android device, Beware! That's definitely a malware. To download the third party APK, users are required to "side-load" the malicious app by modifying their Android core security settings, allowing their device's operating system to install apps from "untrusted sources." However, one of the apps titled "Super Mario" creates additional icons, displays pop-up and banner ads, installs other malicious apps onto victim's smartphone, and performs other intrusive activities without any users interaction, according to Tokyo-based Trend Micro antivirus firm, which detected malicious Super Mario apps 90,000 times this year. "Clicking on these ads or icons will direct users to either adult sites or malicious sites. In either case, the goal is to get users to install various apps," researchers at Trend Micro writes. "While some of these apps are perfectly legitimate, some are suspicious apps distributed by third-party app stores, including more malicious apps that even request for administrator rights." Another app, also titled "Super Mario" and discovered by the security firm, prompts users first to install an app called 9Apps, which then asks for more permissions, including recording audio, reading modifying the calendar and even access to complete SD-card. Downloading apps from third parties do not always end up with malware or viruses, but it certainly ups the risk. So, it's the best way to wait to avoid compromising your device and the networks it accesses.